MORAGA, Calif— The stands at McKeon Pavilion were filled to capacity, which held a bit more than the 3,500 maximum capacity crowd. Hundreds stood to view the biggest game in West Coast Conference history as the top-ranked Gonzaga Bulldogs (26-0, 14-0 WCC) held off the No. 20 Saint Mary Gaels (22-3, 12-2) 74-64. 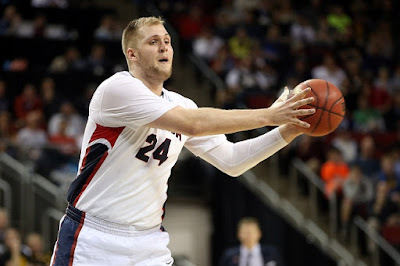 Przemek Karnowski gave Gonzaga 15 first half points on 7-of-8 from the field and added three assists to push them to a 32-32 score half way through the first. "Przemek had an unbelievable first half. He was unstoppable in there,” Gonzaga coach Mark Few said. “There is not many like in college basketball. He is big but he can pass and can deliver if you double team him." Saint Mary’s coach Randy Bennett mentioned how Gonzaga’s big men hurt its strategy throughout the game. During a span of three minutes, the Gaels went on a 9-0 run, culminated with the Gaels tying the game at 23-23. The Gaels’ Jock Landale had a game high of 24 points, while scoring on back-to-back plays, which impressed the home crowd with his footwork. The late surge by the Gaels got the lead to single digits as the first half ended with the Zags ahead 40-31. The Gaels managed to get the game as close as five points in the second half. The comeback would be staved off by a Williams combination of inside-out side plays, hitting a pointer from the corner and a baby hook in the paint. The Bulldogs defense held the Gaels to 37 percent shooting from the field. [On defense] he [Karnowski] was a big mountain of a man, a pretty good rim protector,” Few said. The Bulldogs increased their winning streak to a total of 26, heading into the final stretch of the regular season. Both teams return to action on Feb. 16 as the Bulldogs take on a tough San Francisco Dons squad (18-8, 8-5 WCC) in a conference matchup as the Gaels look to get back on the winning track against the Loyola Marymount University Lions (12-13, 5-9).